Tracing the edge all around Boston Harbor, this easy path takes you past some of Boston's finest views and biggest attractions. 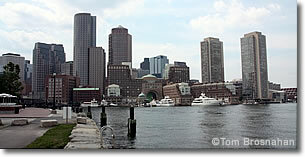 Boston's Harborwalk is a walking, jogging and cycling path winding from East Boston near Logan Airport, through Charlestown past the USS Constitution, through the historic North End and downtown Boston, to South Boston and Dorchester. The path is mostly continuous, though in some industrial areas, for safety reasons, it is a series of "observation points" from which travelers along it may observe maritime industrial activity. 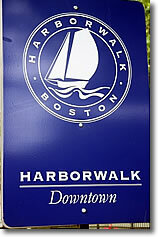 The Harborwalk also connects to new and existing networks of inland trails, including the Emerald Necklace system, the Charles River Esplanade, and the Rose Kennedy Greenway (map). Boston skyline from HarborWalk, Boston MA.